In 2012 we launched Hope Scarves in New Orleans at a Young Survival Coalition Conference. A tearful woman visited our booth and wanted to share the story of her young daughter Lauren who had died of breast cancer. I respectfully took the story and hugged this weeping mom. Then, I tucked her story away and mentioned to my friends, “whoa. We can’t use that story – we are hope scarves. Not sorry for your loss scarves…” And we went back to collecting happy stories. Turning our back to the reality of breast cancer for the easier path of celebrating survivors and passing along scarves and happy stories. Then, in 2014 I faced my worst fear when, nearly seven years after my stage 2 diagnosis, cancer metastasized to my bones. And, I realized how incredibly short sighted we had been only finding hope in the happy stories. I came to understand that hope comes in many forms – not just when you “beat” cancer and put it behind you. But in living in the face of any kind of diagnosis. I also realized scarves and stories are inspiring. But, they aren’t going to save anyone’s life. So, we expanded the mission of Hope Scarves to “Share scarves, stories and hope with people facing cancer.” We recognize hope comes in many forms – and for us this would now include research. The children of Hope Scarves and our first check for research in 2015. 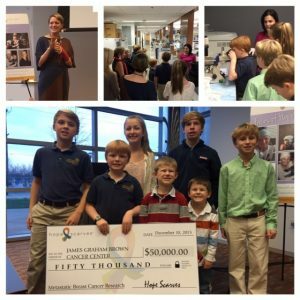 The Hope Scarves Metastatic Breast Cancer Research Fund was created in 2015. 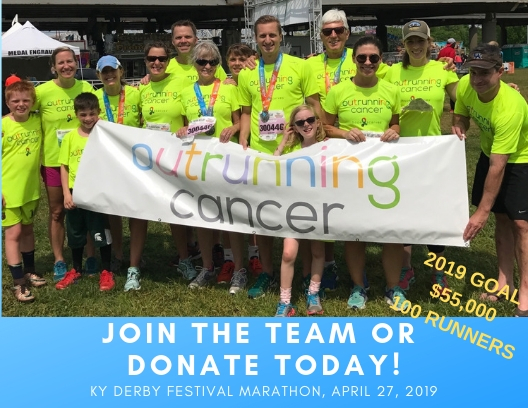 Our first donation was to Brown Cancer Center at University of Louisville for $50,000 to help determine the effects of simultaneous suppression of estrogen signaling and a key metabolic enzyme known as PFKFB3 on sugar metabolism, growth and survival of metastatic breast cancer. Memorial Sloan Kettering – Looking specifically at a new class of MBC drugs called CDK 4/6 inhibitors with the tools of DNA and RNA sequencing to to understand and overcome resistance mechanisms. Dana-Farber Cancer Center at Harvard – Researchers are working to create a “Resistance Atlas” for ER-positive metastatic breast cancer, which should help inform treatment decisions for individual patients and propel the development of new combination treatment strategies. The MBC Project, which Hope Scarves is an Advocate Partner, is a vital part of this ongoing work, providing access to an unprecedented database of genetic information from patients with MBC. What’s even more exciting is each institution matched our donation 1:1. Making our total donation $200,000. AND, as if that wasn’t enough… this year we helped found the Metastatic Breast Cancer Research Collective (The MBC Research Collective). Recognizing small donations here and there aren’t going to move the needle fast enough, we pooled our money together to make a bigger impact. The founding partners in The Collective are Twisted Pink, The Cancer Couch and Hope Scarves. Together, we donated $1.2 million to metastatic breast cancer research this year. We are excited to welcome new partners to The MBC Research Collective to help grow our investment and get even more money into the hands of the most cutting edge researchers working to find more treatment options for those living and dying of metastatic breast cancer. I am incredibly proud of our organization’s ability to expand our mission to include research. I hope other cancer organizations (breast cancer in particular) will recognize they can dedicate a portion to research too. Teaching us to fly fishing, practice yoga and meditate are helpful to live life over cancer – but, think how significant it would be if each of these organizations also made a commitment to MBC research. If you work, volunteer or support an organization such as this – pass along this post and give them my email address, lara@hopescarves.org. I’d love to share how we expanded our mission and became a more meaningful, thoughtful, significant organization as a result. I am grateful for all the donors who made our $200,000 donation to research this year possible. I am grateful for continued stability in my health. I had a PET scan in November that showed continued stable disease. In the midst of our joy, I realize I am one of the lucky ones. Research isn’t moving fast enough to extend the lives of many people. I’m not sure if we can change that… but I’d like to try. You can give directly to our research fund – where 100% of donations go directly to scientists working to find more treatment options for people with MBC. Most of all, thank you. I’m grateful to share this update and look forward to sharing more information about how we are making a difference for people facing MBC. Welcome November. I love November… it’s my birthday month, a time of gratitude, cozy nights sipping tea, reading by the fire. It also marks the end of a very busy month in the breast cancer world. I recently met this spunky survivor at a speaking engagement. She is a 30 year survivor, who lost her daughter in 6 months to metastatic breast cancer. Light in darkness. While we celebrated and cheered across the country, thousands died of breast cancer. Several were my friends. I have a really hard time attending celebration events that raise money for awareness while I watch young moms enter Hospice care. As I wrap myself in a pink boa I think of the agony of treatments that render women so sick and weak that they can’t get out of bed for days on end. Where are these stories in the pink narrative? Where is the compassion? the outrage? How have we grown so blind to this that we only tell the happy stories? I am invited to many cheerful events in October… however, when I speak I bridge the happy with reality. Sometimes to the audience’s confusion or disapproval. I talk about facing cancer, of hope and determination. 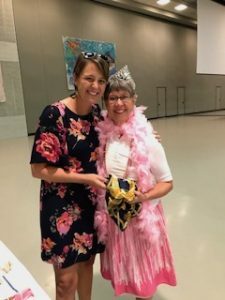 I share smiling pictures of our family as we persevered… but then I tell the “rest of the story.” I talk about the reality of metastatic breast cancer and how many are dying every day… 110. 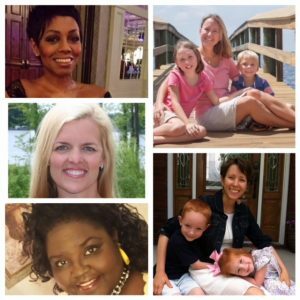 I share the stories of Janice, Mary Ann, Sandra, Wendie, Shayne and more. I have lost so many friends that I can see their beautiful faces, but sometimes not remember their names. I remember the men I have met facing this disease in the shadows – as we forget to acknowledge they are victims. One of the most vivacious, beautiful friends I know entered Hospice care this week. Another, a beautiful woman I shared a stage with at a Twisted Pink gala two years ago died. And yet another, a figurehead in the MBC community who founded Met Up is coming in and out of consciousness as she faces her last days on earth*. This is just one week in the reality of breast cancer. This is the whole story. Ten years ago, on November 9th. 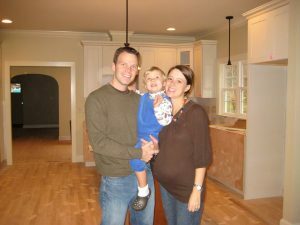 Our world changed forever when we heard the words, “you have breast cancer.” As most of you know, I was 30 years old and 7 months pregnant. One day picking out fixtures for our new home and the next face to face with an oncologist. We have never been the same. That first year of treatment was impossibly hard. Chemo, welcoming a new baby, more chemo, surgeries, pain, fear, anger, disappointment, loss… but ultimately hope. We made it through- changed, stronger, resilient. Determined to take this awful experience and turn it into something beautiful. Bennett was born and the world became bright in the face of darkness. We created Hope Scarves and funneled our pain into something meaningful to help others. But, that isn’t where the story ends. We don’t stay in the bright, joyful light. Because that isn’t the whole story. Like 30% of those who are diagnosed with breast cancer, seven years after the first diagnosis, the cancer came back. It tried to sink us again. For a while we were drowning. But, we found a little bit of light in the darkness. We clung to it. And realized that joy and sadness can exist at the same time. Hope and fear. Five smiles, gone too soon. That’s what I want for the breast cancer movement. A recognition that we can celebrate survivors without forgetting about those who are dying. We can talk about prevention & early detection while devoting MORE money to metastatic breast cancer research. It doesn’t have to be a separate campaign or organization. We have been successful at awareness, not let’s kick it into high gear to support research – metastatic breast cancer research. Just as there is light in the darkness, there is room in the celebration for the sadness. We just need to work at it. It isn’t easy. Believe me finding my way as a metastatic patient is work, every day. Some days are harder than others. 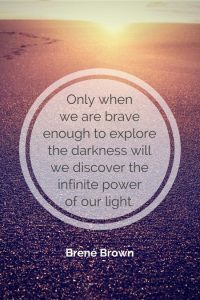 So, as a breast cancer community – can we work at combining the light and the darkness to create a more realistic approach to breast cancer advocacy? Can we broaden the conversation & talk about living and dying. Shift our focus to supporting and finding more treatment options for those facing death. Teaching us to fly fish, meditate and do yoga is wonderful. Sharing scarves and stories of hope is inspiring. But, none of this will save our lives. We must discuss and support metastatic breast cancer research. We can’t be afraid of the dark. Don’t forget Jill, Kathryn, Lisa, Mary Eleanor or Nikki. Please. Celebrate your survivorship while also demanding money for metastatic breast cancer research. We can’t abandon the hundreds of thousands who will die of this disease, unless we find more treatment options. Tell the whole story of breast cancer- the pretty and the ugly. Don’t be afraid to let darkness shadow the pink – it might lead to the brightest light of all. Only then will pink really matter. Let’s make it so. *As I hit publish, I learned that Beth died. The most dedicated, determined leader of the MBC community today. Her words and passion inspired thousands. Me included. This post is in her honor. May I help continue to push the needle she shoved with all her might. Rest in peace, Beth.